Have you ever purchased a delicious-looking donut, dropped the donut after one bite, watched it roll into the street and get run over by a semi-truck? If so, you might be able to relate to Sebastien Bourdais’ afternoon at the Long Beach Grand Prix. 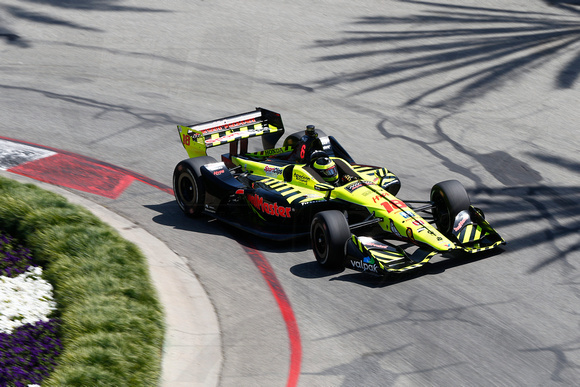 One more look at this pass by @BourdaisOnTrack.???? But that move to take second place turned out to be the highlight of his day, because it all went to crap shortly thereafter. First of all, Bourdais was penalized by IndyCar race control — which ruled he used the pit exit lane to make the pass. He had to drop back and give one of his spots back as a result. But Bourdais insisted he was actually forced into the lane by Scott Dixon — who was one of the cars he passed three-wide — which made the incident “an avoided crash that turned into a brilliant pass,” he said. After the penalty, Bourdais fell back to third and said he was so fired up about it that he made another bold pass to retake second place the very next lap. …BUT then he did this moments later.???? He only got angrier five laps later, when a caution brought out by teammate Zachary Claman De Melo occurred right when Bourdais was coming to pit road. As a result, Bourdais had to drive through pit road — losing track position — and return for his pit stop under caution. But that wasn’t even the end of it. Bourdais got even more upset after he had to restart back in the pack — where “you end up racing idiots who don’t give you any room.” He had only gotten back up to 10th when rookie Jordan King spun him around in the hairpin turn, finishing off the bad day. “Jordan feels like a million dollars, dumps it in there and turns us around. Alright. Have at it, boys,” Bourdais said sarcastically. REPLAY: Here’s another look at the incident in Turn 11 involving @BourdaisOnTrack and @42jordanking.???? He just had nothing to show for it. Oh, and there was one more thing he was mad about, Bourdais said. Long Beach Grand Prix: How much racing is too much? There’s no such thing as too much racing — well, perhaps unless there’s not enough time to fit it all in. Such was the case on a glorious Saturday at Long Beach — “Super Saturday,” which squeezed in track activity for six different series over the course of 11 hours. It was a fantastic day for anyone who likes racing even the tiniest bit, and a near-perfect one when you factor in the sunshine, spectacular oceanside setting — complete with a harbor and lagoon — and the huge motorsports expo that takes up the entire Long Beach Convention Center floor. But there was one small blemish on the day: Robby Gordon’s Stadium Super Trucks, which had a 20-minute window to race between IndyCar qualifying and the Motegi Racing Super Drift Challenge, had to end its race after only six laps. Stadium Super Trucks leap off jumps placed as obstacles in the street course, and driver Apdaly Lopez accidentally flipped his truck off a jump on Lap 5. Typically, track workers just roll an upside-down truck back over and keep going. But this time, it took too long — and officials ran out of time to restart the race. A spokesman for the series was critical of the amount of time to get the truck rolled over, telling reporters the race should have gone back to green. Race winner Gavin Harlien said he didn’t expect the race would be over when the caution came out and thus felt a little shortchanged. “That’s not how I want to win, but, I mean, I’ll take it,” he said. On the positive, side, this sort of thing is only possible when so many series share the track at once. That’s actually a good problem to have from a fan standpoint. For a $65 general admission ticket (or a $100 weekend pass with a reserved seat), spectators could spend the entire day wandering the course, which snakes its way through the prime real estate of the Long Beach waterfront. There are multiple spots to stop and observe the cars, take photos or just bask in the California sun; personally, I walked 7.9 miles during the course of the day while exploring the circuit. From IndyCar practice and qualifying (Alexander Rossi won the pole) to an IMSA’s slick sports cars to Gordon’s trucks to Historic Trans Am cars (that ran in the 60s and still race), it seemed like a non-stop schedule. As I write this, there are still cars on the track — a drifting challenge competition that goes until 8 p.m. local time. Anyway, there’s some solace knowing another Stadium Super Trucks race will run tomorrow — and since it’s scheduled for after the IndyCar race, the entire thing should be completed this time. If not, that’s the only way “too much of a good thing” could ever apply to racing. You can’t hear the cars inside IndyCar Race Control for the Long Beach Grand Prix, let alone see them. Buried in the bowels of an arena attached to the Long Beach Convention Center — a venue that will be used for Disney On Ice at this time next week — IndyCar’s top officials are positioned in a windowless room to watch Friday’s second practice session. The room is filled with monitors — 20 different camera angles of the track are displayed at once, not counting a smaller box showing a variety of in-car cameras — along with more than a dozen people who each have a crucial role in making sure everything goes smoothly. In the center of it all is first-year race director Kyle Novak, the conductor for a complicated orchestra. He’s in charge of determining whether the track needs to have a local yellow flag, a full-course yellow or red flag, in addition to deploying safety personnel. Flanking Novak are IndyCar’s two stewards — former drivers Max Papis and Arie Luyendyk Sr., who remain standing at all times. Their job is to determine penalties; if you hear an incident is under review, they’re the ones doing the reviewing. Just past the stewards are those tasked with communication to various units: One person conveys Novak’s message to the teams, another speaks to the safety workers and so on. 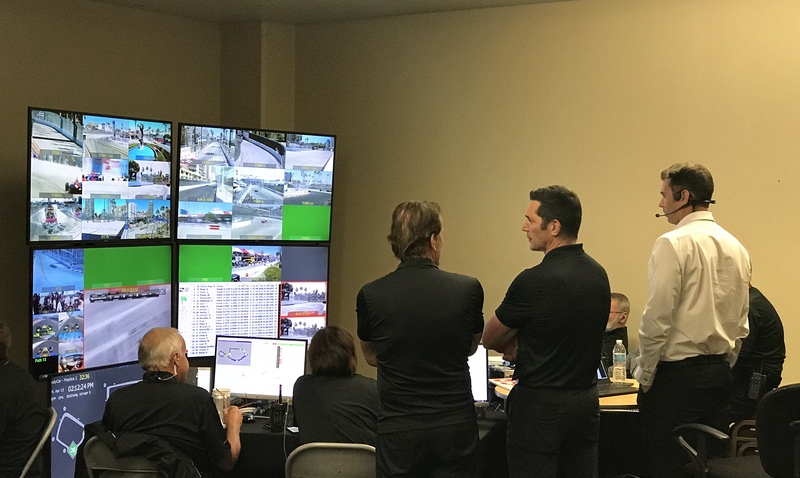 There are also other officials nearby, such as a man who watches a screen full of dots moving around the track — to look at the gaps between the cars — and a woman in charge of IndyCar’s instant message system (every command from race control is also sent via IM in order to provide a record of it, and teams can send back IMs with questions). Although it’s just practice, but the room is buzzing with activity. Oddly, though, there is no sound — no race commentary, radio chatter or vehicle noise — other than the officials communicating with each other. The stewards believe it’s important to issue the same penalties during practice they would in a race, setting a standard of consistency so the drivers know what to expect. For example: Rookie Robert Wickens cuts the exit of pit lane too early — there’s an orange line that marks where the transponder must cross in order to be scored — and receives a pass-through penalty after the footage is reviewed. A pass-through during practice isn’t too damaging — aside from wasting a couple laps on tires — but it would be in the race. So it’s somewhat of a warning: This will hurt you a lot more on Sunday, so don’t do it again. The stewards carefully watch any interaction between other cars. Papis’ eyes scan the map of dots to see drivers racing close together, then dart to the camera angle showing that battle. Papis believes the drivers and IndyCar are “one team,” and his role is not an adversarial one. He and Luyendyk view themselves as a resource for the drivers, providing an education on what they did incorrectly and gathering evidence during the sessions to present afterward. For example: Luyendyk pulls out his cell phone to take screenshots and video from the IndyCar replay system, which is like if NASA Mission Control had TiVo. He’ll take the visual proof to the drivers in question as soon as practice ends. Both stewards must agree on a call in order to issue a penalty, and IndyCar president Jay Frye serves as the tiebreaker for any disputes. When there’s a potential incident to review, replay officials call over the stewards for a closer look. Everyone in the room seems to work methodically and calmly. But their voices rise and carry an extra urgency when safety workers are present on the track, exposed to danger. Officials seemed to dislike that one car drove through a local yellow safety zone carrying too much speed. And it wasn’t just a feeling; they had the numbers to prove it. The computer said the driver went through at 94.5 percent of his typical lap speed, and Papis said drivers are asked to slow down a minimum of 15 percent — showing they at least made an effort to use caution. Practice ends before all the penalties can be issued and served, so Papis sets off to speak with some drivers instead — clutching small printouts that looks like betting slips from a Vegas sportsbook. In general, the stewards don’t want to issue penalties. Papis said they ask themselves two questions before doing so: First, does the action affect safety? Second, does the action affect competition? If the answer to one of those questions is yes, a penalty is more likely than not. Papis looks around the room and shakes his head at all the technology present. “If I would have come in here and gotten this education when I was driving, I would have used the F word a lot less,” he said with a grin. The session ends when Takuma Sato suddenly has the back end wash out while entering Turn 1, smacking the wall. “Car in the wall, Turn 1. Red flag,” he says. The officials guide the safety workers to Sato’s car and watch until he gets out, then begin to pack up so the next series can get ready to run.